When dealing with patients, you need to make sure all of your equipment is top-notch. Using professional grade gear is essential to keep you and others protected from dangers, especially in the medical field. That's why Med-Part is bringing you professional grade nitrile exam gloves to offer quality protection and enhanced strength so you get the job done faster and easier. Get yourself a pair of top quality gloves for your home or office. They're ingeniously designed to resist all sorts of usage so you get the most from them. Heavy duty construction matched with great reinforcement means they don't break or tear easily. They come with textured fingertips for ideal grip for your wet or dry applications. They're also very comfortable so you won't be bothered with slight discomfort even during them most intense procedures! With professional usage in mind, our gloves are ideal to serve in various fields. Due to their top grade material, they come in handy for industrial, scientific, and home use. They're great for cleaning, food prep and cooking, and beauty salons. Our gloves are created to be for single-use and should be disposed immediately after their intended use. They are not made with natural rubber latex and do not contain powder eliminating the possibility of allergic reactions commonly associated with latex proteins. They are ambidextrous so they fit in both left and right hands without compromising comfort. Store in a dry ventilated environment. Do not store above 100° F (37°C). Avoid direct sunlight, fluorescent lighting, heat and moisture. BEST PREMIUM GRADE GLOVES: Get high quality gloves designed for professional use to keep your hands protected. With enhanced strength and tear resistance they offer unmatched reliability. NO LATEX, NO POWDER - NO PROBLEMS: Avoid potential allergies and discomfort with our gloves - without the use of latex or powder, your body will be kept in optimal safety from potential allergens. TEXTURED FINGERTIPS: When procedures get messy, holding on to equipment can be difficult - these gloves come with textured fingertips providing maximum gripping power for wet and dry objects. 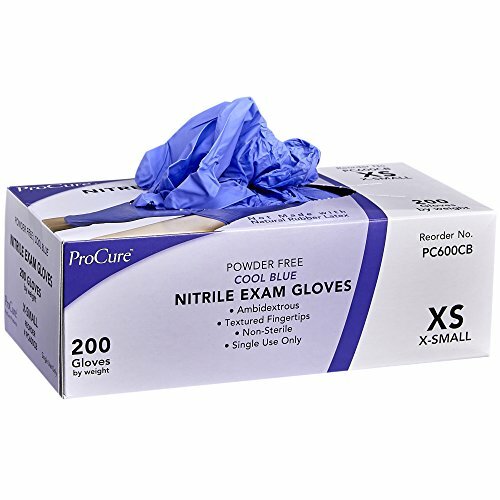 MEDICAL, FOOD & HOME USE: These exam gloves can be used in many settings, medical & dental offices, scientific labs & warehouses, restaurants & food prep, home cleaning, beauty salons & many more! HOME OR BULK SUPPLY: Choose from boxes of 200, 400 or a case pack of 2,000 gloves. They come in sizes from extra small through extra large, and are ambidextrous and super soft for the ultimate comfort. If you have any questions about this product by ProCure, contact us by completing and submitting the form below. If you are looking for a specif part number, please include it with your message.